Jabari Bird scores 25 points to help Maine improve to 2-0. Trey Davis didn’t play at all Friday night in the Maine Red Claws’ G League season opener. When he had a chance to take the court Sunday afternoon at the Portland Expo, he made the most of his minutes. Davis scored 17 points as Maine pulled away from a scrappy Erie BayHawks squad to win 102-96 before a crowd of 2,193. The Red Claws closed out the game with an 11-2 run after trailing by three with three minutes remaining. A 6-foot, 180-pound point guard, Davis scored 10 points in the second quarter on drives and his 3-point push shot. He added seven more in the third quarter as the Claws dug out of a 67-58 deficit to enter the fourth with a 75-71 lead. Bird finished with 25 points and 10 rebounds. 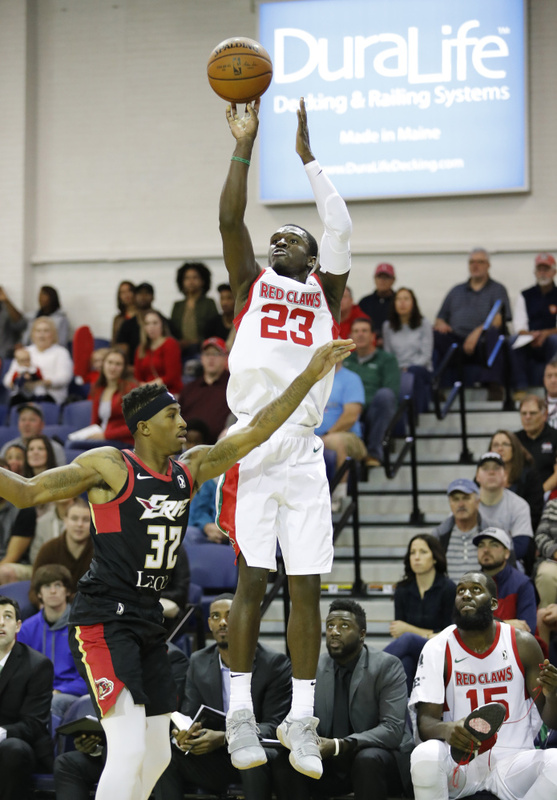 His double-pumping drive with 2:57 remaining cut Erie’s lead to 94-93 and sparked Maine’s strong finish, with Kadeem Allen and Daniel Dixon sandwiching close-range baskets around a pair of free throws to put the Claws ahead 99-94. Dixon came off the bench to contribute 20 points and nine rebounds. Allen had 10 points and seven rebounds. The Claws connected on only 5 of 24 3-point attempts, but they outrebounded the BayHawks 53-35. Erie (0-2) opens its home season Friday night in Pennsylvania against the Red Claws (2-0). The BayHawks lost their season opener on a buzzer-beater in Grand Rapids, spoiling the G League head coaching debut of Portland native Josh Longstaff. Josh Magette, the league leader in assists the past two seasons, led Erie with 20 points and 16 assists – two more than Maine’s entire team. Forward Tyler Cavanaugh, who had 19 points and 11 rebounds against Grand Rapids, was called up to the Atlanta Hawks on Saturday while on the way to a team practice at the Expo.